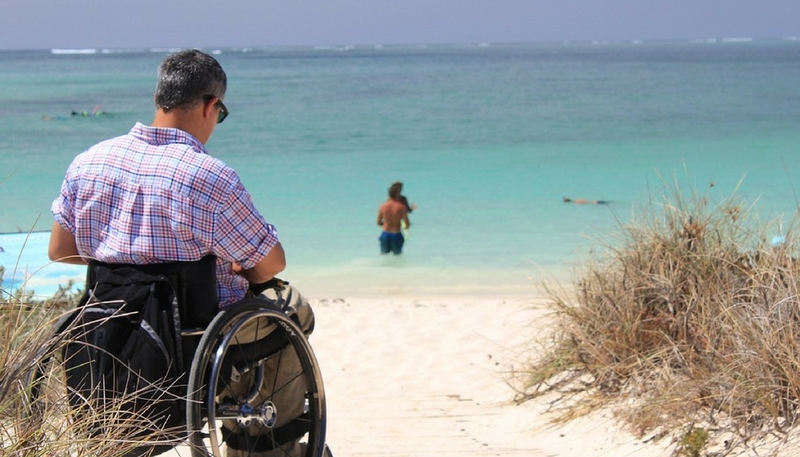 Whether you are new to traveling with a disability or a bona fide globetrotter, these tips will help you plan the ultimate wheelchair accessible vacation. When I was planning my first trip, I wasn’t particularly “able.” I was only weeks removed from major surgery and could barely sit myself up in bed without assistance. There is no shame in needing help as a result of disability. Be honest with yourself about what you can and cannot do, then try to find ways in which you can be accommodated while traveling. Rent medical equipment, travel with a personal care assistant, dust off your power wheelchair and take it with you. When planning a trip to a faraway destination, it is better to be safe than sorry. Don’t be sorry—arrange the assistance you’ll need and remove the stress of unnecessary uncertainty from your vacation. There is much more accessible travel information available on the internet today than there was when I planned my first trip as a wheelchair user in 2014. With WheelchairTravel.org, I set out on a journey to empower other people with disabilities to live life fully alive through travel. While rolling around the world in my wheelchair, I’ve learned that it is possible to dream big. You don’t have to settle for a mediocre or boring trip. Accessibility is on the rise, and you can now touch the Pyramids of Egypt, reach speeds of 40 mph while zip-lining in Las Vegas or tour Beijing’s Forbidden City. These experiences and more are open to people of all abilities! That said, beware of bad information. There are many websites that peddle false informationabout accessibility, so compare what you read with multiple sources. People with disabilities have been afforded a set of civil rights that are designed to protect us from unfair treatment in the marketplace and in society. Whether you are dealing with an airline, hotel, restaurant, attraction, taxi or transportation provider, you have rights to equal access in the United States, and in many other countries around the world. It is important to understand what rights you have, so that you can protest in situations where they are not upheld. If you are traveling in the United States, read about the Americans with Disabilities Act and the Air Carrier Access Act. Print the relevant sections of these laws out, and bring them with you. When things go awry, stand up for yourself and report violations to the Department of Justice. Accessibility is never perfect. As you research your trip, begin developing a set of expectations that align with this fact. In writing about destinations and attractions on this website, I have shared both the good and bad of accessible travel. Earlier in this article, I mentioned that seeing the Pyramids of Giza is possible. But in writing about that experience, I clearly stated that the interior chambers of the pyramids are not accessible. In setting our expectations for travel, it is important to throughly research accessibility. If you plan to visit Cairo, Egypt and roll your wheelchair into the pyramids, you will be disappointed. But with proper research and realistic expectations, you’ll avoid that disappointment and make the most of the accessibility that does exist. A competent travel agent will do more than book your flights, hotel and rental car. Their skill sets should include a passion for researching destinations and experiences. Through these efforts, they will be able to answer questions about what to expect and help set your mind at ease. But, you don’t have to turn over control of your entire trip to the travel agent. If you’re on a budget, hire the travel agent to take care of only what you cannot. Got your flights booked and activities planned, but still don’t have a hotel? A travel agent can take care of that for you. Just remember—not all travel agents are created equally, so you can shop around. And, when traveling with a disability, it’s always best to work with one that has dealt with clients like you before. When I give a talk, workshop or speech about accessible travel, I always tell the audience that their best resource might be sitting right beside them—their peers in the disability community. It is our collective experiences, each from a different perspective, that come together to define the accessible travel industry. If you have questions about traveling with a wheelchair, ask the people you know who have done it themselves. And, if you don’t know anyone who has, come back here – post your questions in a comment, and many people (myself included) will try to help you out. I think back to that time when my wheelchair died in Beijing and I was stuck on the sidewalk, alone, with no way to get back to my hotel. Sure, I could have called the police, but I instead asked for help. A stranger stepped up, responded to my need, and pushed me back to my hotel. You see, humans look out for one another. People step up to help others all the time. And that is why you should have faith—let go of your fears and explore the world!